Finally, I have scanned in the film photos (minus the duplicates) we inherited with this home. The former owner, who lived here from the 90's until we bought the home in November, 2012, passed along a 4x6 photo album, and I've been meaning to get these scanned in for over a year. I wanted to share what we know things looked like in the past, what they looked like when we bought the place, what the demo looked like, and of course what things look like now. I've done a before and after of most of the rooms, but it's fun to see what the house looked like before we were even in the picture. None of the images were dated, so I have no idea when these were taken, but still very fun to see old (possibly original??) fixtures, colors, textiles, materials used. 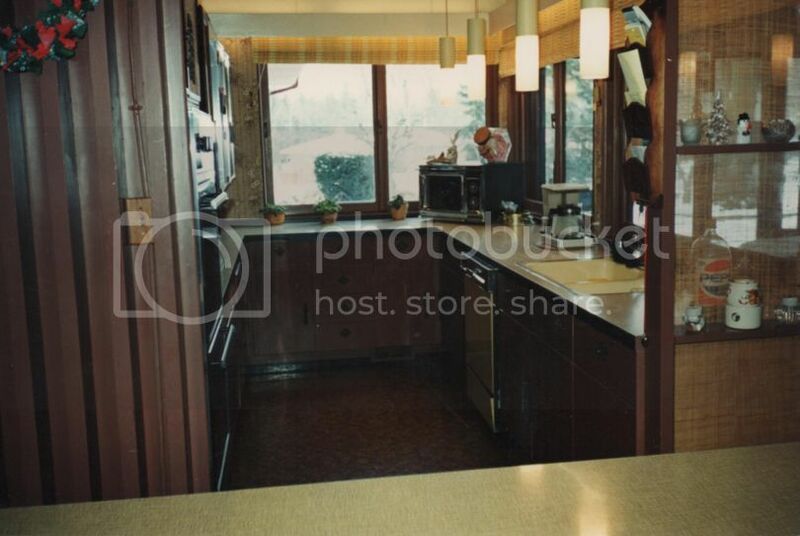 The favorite find is that they had a hanging side-by-side fridge & freezer installed over the countertops like cupboards. Here we go... The original kitchen was in the same spot when we bought it, but this photo is a far cry from what it looked like when we took possession. 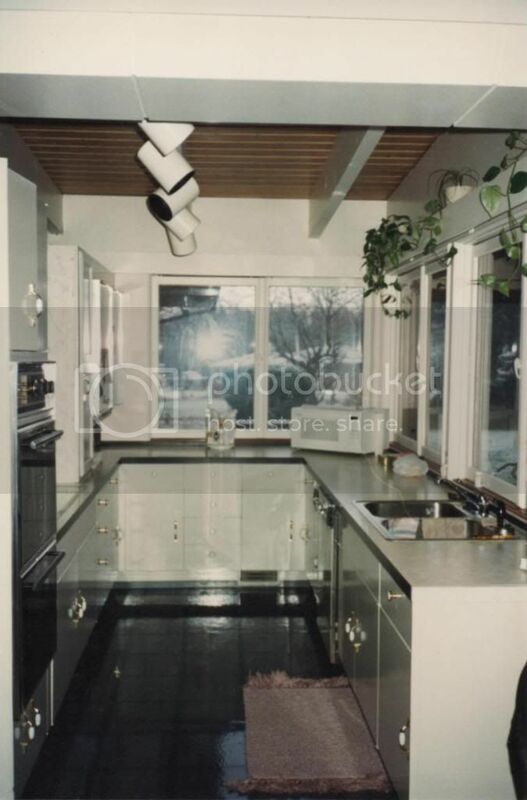 Looks to me like metal kitchen cabinets, ornate pulls, Formica countertops. I actually LOVE the light fixtures here - although they seem kinda low and I'd have to imagine people hit their heads. Ceiling beams have not been painted white yet. A slightly different angle of the same shot above. From this image alone, I assumed there were a side-by-side hanging fridge & freezer, double over and stove top between them. I confirmed this with the original owner's sister - she said she'd never seen anything like the hanging fridge & freezer. The flooring here is what we found under several layers of other flooring. Original laminate, I'd guess. 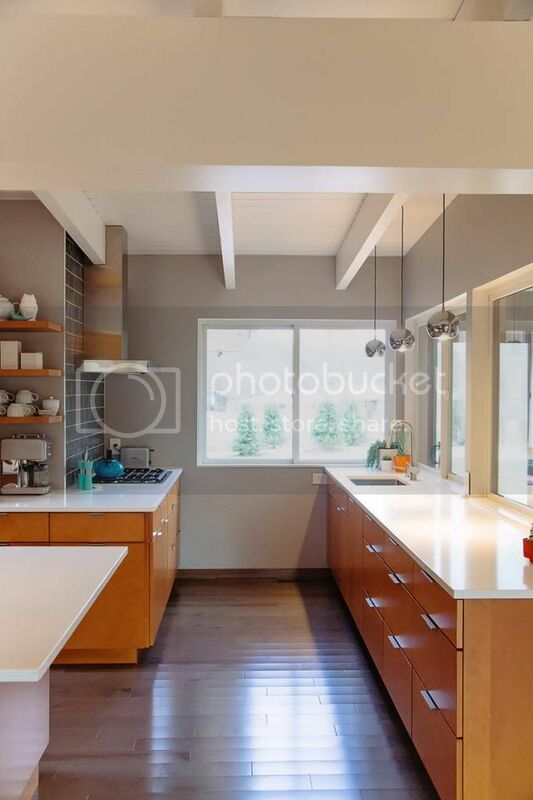 Someone decided to lighten the kitchen up at some point by painting it white. 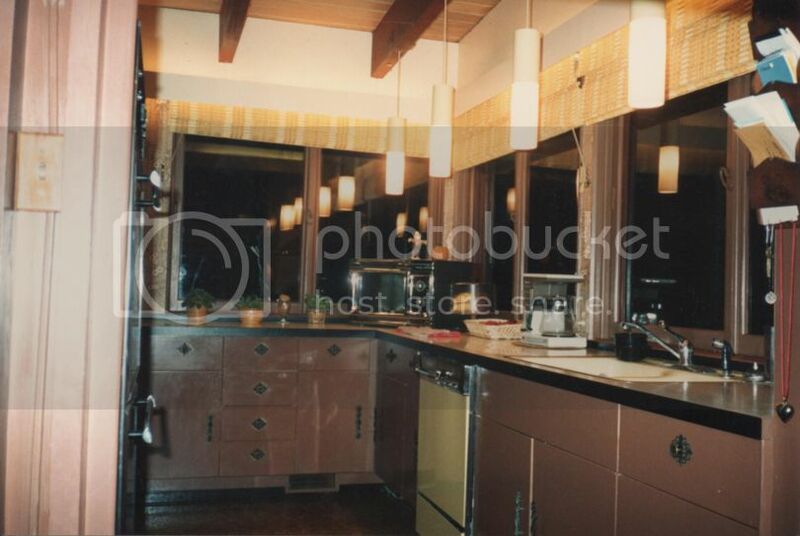 I believe they are the same metal cabinets, just painted white, with less ornate pulls. You get a better glimpse of the hanging fridge & freezer here (I'm bummed I don't have a straight-shot on this one!) The awesome lighting has been taken down at this point, and track lighting installed. Ceiling beams have been painted white. Not sure what the floors are - possibly peel & stick tiles, which we found on top of the possible original floors. We are getting closer to what was going on when we bought it - new cupboards, standard side-by-side fridge, electric range. Updated cabinets in white. Now there are two sets of track lighting. 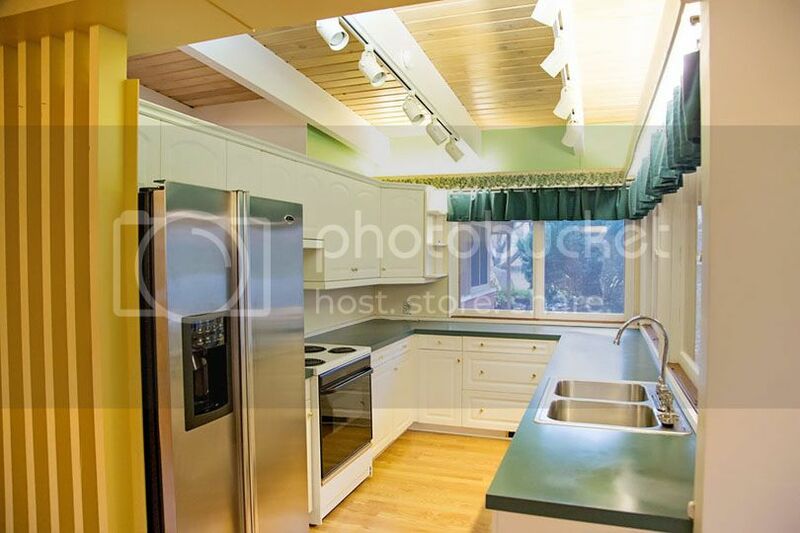 Countertops are green Formica. 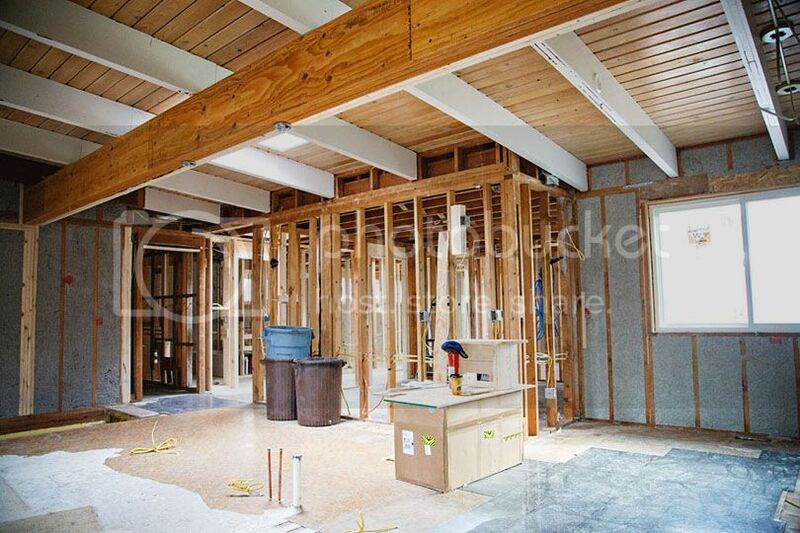 After demo, this is what it looked like about one year ago today, March/April 2013. Seems like eons ago already! And while I keep moving things around, decor-wise, this is basically what that portion of our kitchen looks like today. I'd KILL for those lights in the first image - they would have been perfect in here! You can see many more "after" images in the full kitchen post here. 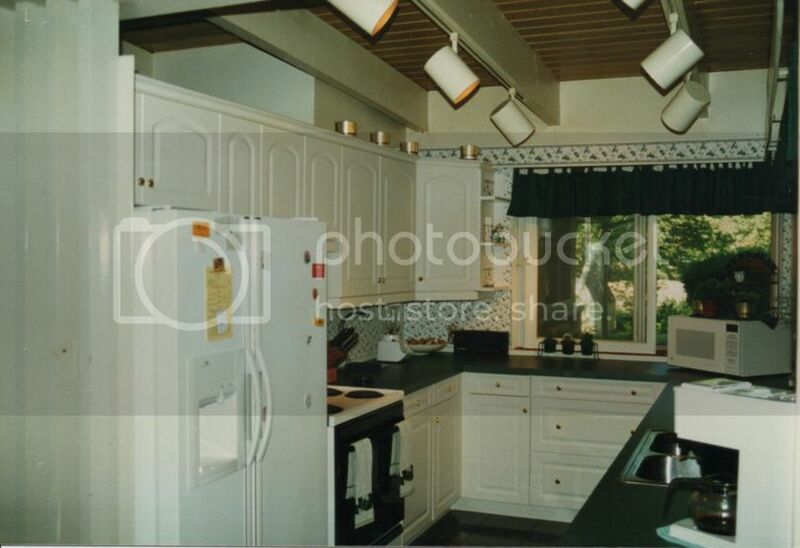 You did such a great job taking your kitchen back to what it might have looked like originally (only better!). It looks fantastic...love it!